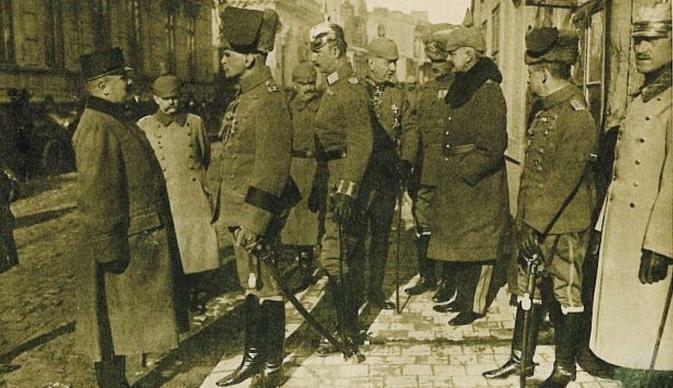 After the withdrawal of the Romanian Government to Iași (November 1916), there were numerous officials, representatives of the Romanian authorities, as well as the majority of the administrative staff, that remained in the territory occupied by the German troops. The Brătianu government left important police and gendarmery forces in the occupied parts of Romania to maintain public order. Also, with the agreement of the Government and King Ferdinand, there were several important political, mainly conservative, politicians known for their sympathy towards the Central Powers, that stayed in Bucharest. The most prominent politicians who remained in the capital of occupied Romania were Petre P. Carp, Alexandru Marghiloman, Titu Maiorescu and Constantin Stere, important representatives of the pro German side during Romania’s neutrality (1914-1916). Either from Russophobia or from the firm conviction that the Entente cannot win the war, important political leaders, as well as important names of Romanian culture, argued that Romania would have more to gain if it had joined Germany. When Romania entered the war on the side of the Entente, some of these “Germanophiles”, as they became known, provided the liaison between the Romanian government and the representatives of the Central Powers. Marghiloman and Maiorescu noted in their memoirs that they were seen as a reserve government in Romania’s relations with the Central Powers, in case the participation in the war with the Entente would have ended with failure, and King Ferdinand approved of this. Immediately after the government’s withdrawal to Iași, the conservatives left in Bucharest met several times to discuss the country’s situation. Some of them were angry that the King accepted Romania’s entry into war alongside Russia. The most prominent in this respect was P.P. Carp, whose favourable attitude towards the Central Powers was manifested at the Crown Council of August 27, 1914. In the context of the Romanian disaster in late 1916, Carp considered that the best solution for the country was the replacement of King Ferdinand with one of the sons of the German Emperor Wilhelm II. The conservative politician hoped that in this way the territorial integrity of Romania could be guaranteed. However, the most outlandish solution to solve Romania’s problems was advanced by Constantin Stere. He also wanted the removal of King Ferdinand, but he did not propose to replace him with one of the Kaiser’s sons, but with Emperor Charles I of Austria himself. Thus, Stere considered that a “personal union” could be achieved in this way, with Austro-Hungary and Romania becoming a federation. Carp and his supporters’ proposals were well received by the German occupation forces. The German Military Governor of Romania, Infantry General Tülff von Tschepe und Weidenbach, sent a report to Berlin in which he wrote that around him it was said that Emperor Wilhelm II would be willing to support Romania’s post-war reconstruction under two conditions: amending the Constitution and installing one of his sons on the throne of the country. Marghiloman and Maiorescu, however, opposed Carp’s proposals, and they remained supporters of King Ferdinand. Marghiloman explicitly stated that he did not want to add to the country’s difficulties a dynastic problem. This divergence would lead to the division of the Conservative Party into two factions, one led by Carp and the other led by Marghiloman. The group led by P.P. Carp collaborated with the German army and administration, while Marghiloman’s faction adopted a reserved attitude towards the occupation forces and avoided any political activity until the beginning of 1918. In the summer of 1917, the German administration tried to organize a plebiscite to give P.P. Carp the power to form a government in the occupied territory that could conclude a separate peace with the Central Powers, backed by Austria-Hungary. As soon as he learned of this initiative, Marghiloman did everything to prevent the plebiscite. Ultimately, the hopes of P.P. Carp were dashed due to clear popular hostility. The conflict between the conservatives was ultimately decided in favour of Alexandru Marghiloman, who was empowered by King Ferdinand to form the government in March 1918, with the approval of the Central Powers. Victor Atanasiu, Atanasie Iordache, Mircea Iosa, Ion M. Oprea Paul Oprescu, România în Primul Război Mondial [Romania in the First World War], Military Publishing House, Bucharest, 1979. Gheorghe Platon (coord. ), Istoria Românilor [The history of the Romanians], vol. VII, tome II, Encyclopaedic Publishing House, Bucharest 2003. Pia Alimănișteanu, Însemnări din timpul ocupației germane (1916 – 1918) [Notes from the time of German occupation], Corint Publishing House, 2017.